The most requested feature (even more requested than curving walls) was the ability of applying color to walls. About 20% of the questions in the last couple of months was “How can I color my walls?” and after some testing & tweaking we are glad we can now reply to these questions with a simple instruction on how to add color to your walls. It’s really simple. 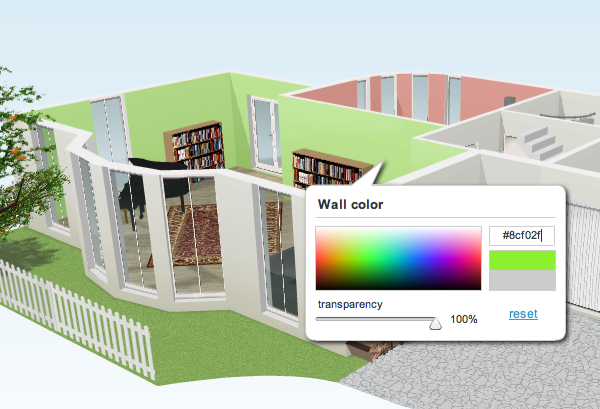 View your plan in 3D and just click on a wall to get the wall coloring menu. The actual picking of colors probably doesn’t need any explanation and if you don’t like your chosen color, you can use the reset button to go back to the uncolored state. We also added an RGB code field that allows you to copy and paste a color from one wall to another. As a bonus, we also added a transparency setting. 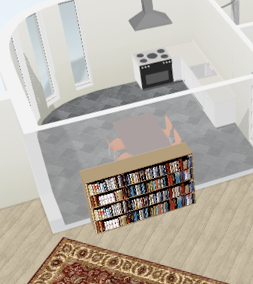 Not only you can play with the coloring of your space, but you can also make a wall more or less invisible to give a better impression of the interior. Both the color as the transparency are applied to only one side of a wall. This allows you to look into rooms from the outside using a transparant setting while the wall is still non-transparent when you look at this wall from inside. We hope you like this update but please feel free to use our forum to give suggestions in improving the workflow or report any bugs you might run into.